Add Facebook, Twitter, and other social media buttons to your form's confirmation page. It’s usually a challenge marketing and promoting anything these days and getting people to do it for you is the holy grail. It might be one of the reasons why social media marketing has gotten so big these days. In this tutorial, we’re going to show you how you can add social media sharing buttons to your form so that you can get your users to help you spread the word and make your next promotional campaign successful. 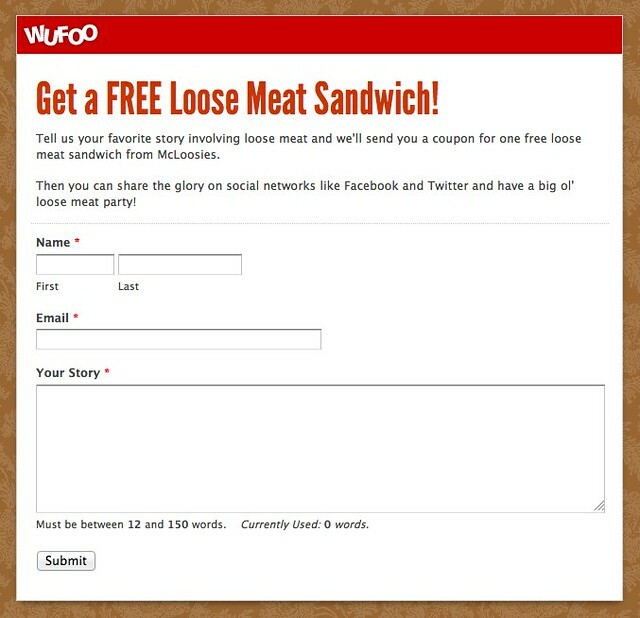 For the sake of demonstration, we’re going to create an example promotion that gives away…I don’t know…FREE Loose Meat Sandwiches from McLoosies (my favorite!) and we’re going to use a Wufoo form to collect email addresses to let people know that our shop now features MORE loose meat! Here’s how we’ll get our fans to help spread the news. 1) First, build a form. You smarties are probably masters of this but just in case you need a refresher on form building, check out this documentation (including video walkthrough) of how our Form Builder works. Here’s Twitter and Facebook all together. All the “whitespace” is removed from the HTML so they show up nicely in a row. If you use this as a template, remember to customize the URL’s and messages for your own promotion! The icons we’re using are super nice icons from Komodo Media. That set has a bunch more icons in it if you wish to use different/more services. - Customize the look of your form with custom colors, backgrounds, and fonts. - Integrate your form with an email marketing service or CRM.